GO DUTCH! 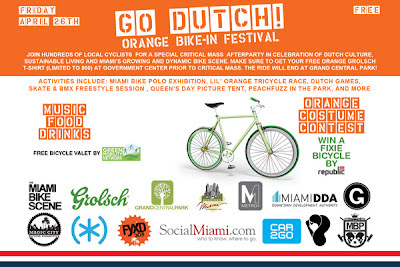 again this year at Miami’s largest Queen’s Day celebration with the Omni Parkwest Redevelopment Association, The Miami Bike Scene, and Grolsch Premium Lager at Grand Central Park in Downtown Miami on April 26th from 7 - 11pm. 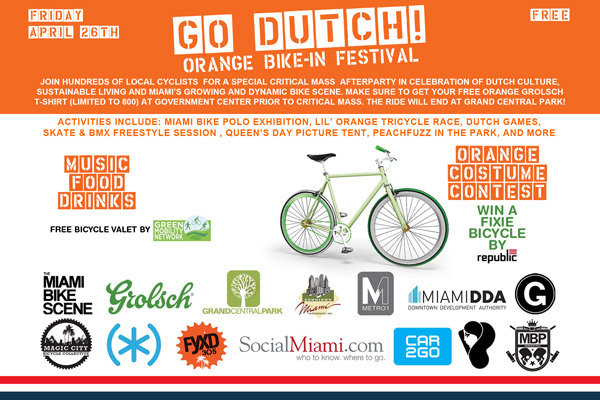 Join hundreds of local cyclists for a special Miami Critical Mass after party in celebration of Dutch culture, sustainable living and Miami’s growing and dynamic bike scene. 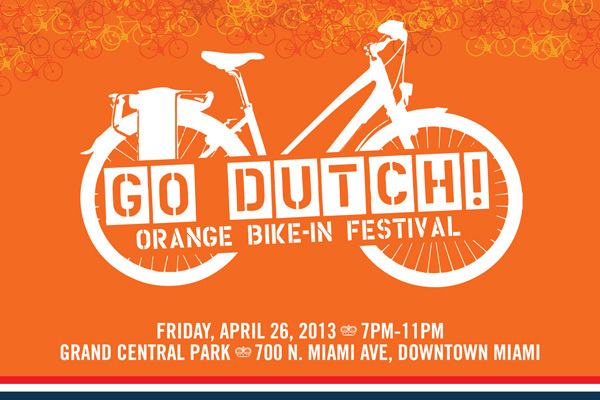 Make sure to wear your craziest Dutch-inspired orange costume for a chance to win a brand new fixed gear bike! Also, get to Government Center early prior to critical mass for your free orange Grolsch T-shirt (limited to 800). Admission to this one-of-a-kind event is free and all bar proceeds to go to Grand Central Park for improvements and maintenance to the facility. Go Dutch! will expand on last year’s festival atmosphere by adding more games and bike-related activities. Attendees arriving on a bicycle and Dutch-inspired apparel can enter the "orange costume contest" for a chance to win a custom fixed gear bicycle by Republic Bike. Additionally there will be food, drinks, and music provided by DJ DZA for a special "Peachfuzz in the park". Grolsch will distribute 800 orange t-shirts before the start of Miami Critical Mass at Government Center, it is advised you arrive at 6:30pm if you wish to get a free t-shirt. The limited shirts will entitle participants to $4 special on Grolsch 16oz beers at the park. Everyone is highly encouraged to wear orange! Green Mobility Network will be providing FREE bicycle valet on a first come first serve basis. Bike valet space is limited so it is highly recommended that you bring your own lock as a precaution, additional on-site self-parking is available for cyclists. Miami Bike Polo will be playing exhibition games and there will be skate & BMX freestyle sessions at the new DIY skate park area of Grand Central Park. The Magic City Bicycle Collective will have a table and repair stand set up at Grand Central Park. They will demonstrate simple bike care and do minor bike repairs and maintenance. Buy them a beer or make a donation! This is exciting happening occurs only once a year so even if you don't attend Critical Mass you should still definitely stop by the festival. Grand Central Park is located on N.Miami Ave & NW 7th St, get directions.